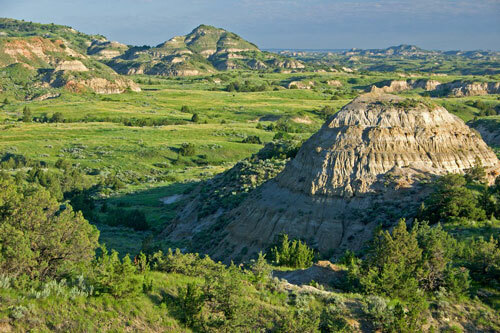 Situated in the northern plains, North Dakota covers more than 70,000 square miles. It adjoins Canada to the north and is bounded on the east by the Red River. Bismarck is the capital of North Dakota. Located in central North Dakota on the east bank of the Missouri River, the capital city of Bismarck is an agricultural and transportation center for the state. Bismarck has a strong healthcare presence, and some energy industry, as well as construction equipment manufacturing. The downtown area is located along the Missouri River with an abundance of parks and attractive waterfront areas. Bismarck provides the usual capital city amenities, but entertainment options are somewhat lacking. The city boasts one of the lowest crime rates and costs of living for a capital city. Sunshine is abundant, but the winters are very long, with strong winds and a chance of snow in all months except for July and August. On this page you will find North Dakota real estate listing services as well as selected realtors and real estate agencies in the State of North Dakota. For your convenience, this page also provides access to North Dakota real estate directories and realtor resources. A list of housing finance resources for the State of North Dakota can be found on this North Dakota Housing Finance Agencies web page. Whether you're buying or selling a house or farm in North Dakota, this wealth of information can help you with the sale process. Find homes for sale, apartments for rent, mortgage information, and real estate agents in North Dakota. Real estate listings can be filtered by price, home type, and number of bedrooms. Find homes for sale in North Dakota using a map or drop down menu. Real estate firm serving the Bismarck area. Providing real estate services in Fargo, ND and Moorhead, MN areas. North Dakota custom home builder directory, including location and contact information as well as website links. North Dakota manufactured home supplier directory, including location and contact information plus website links. Search the MLS database for active real estate listings, view upcoming open houses, and find real estate professionals in the Bismarck - Mandan area of North Dakota. Real estate licensing and regulatory body. ND Real Estate Appraisers - real estate appraisal services in North Dakota. ND Real Estate Investments - real estate investing services in North Dakota. North Dakota Information - North Dakota atlas and travel guide. North Dakota Maps - North Dakota geography and infrastructure.